DDU-GKY is thedemand-driven placement-linked skill training initiative of the Ministry of Rural Development,Government of India (MoRD), uniquely aimed at rural poor youth between 15 and 35 years of age,with the purpose to create income diversity in poor families and help rural youth realize their career aspirations. When did the scheme start? Is it new? DDU-GKY has its origins in the ‘Special Projects’ component of the Swarnajayanti Gram SwarozgarYojana (SGSY), which was positioned as a holistic livelihoods intervention in 2004. The SGSY special projects provided time-bound training and capacity building for bringing a specific number of Below Poverty Line (BPL) families above poverty through skilling and placement in jobs that provided regular wage employment. Up until May 2013, around 8.60 lakh had been trained and 6.80 lakh youth had been given placement. This programme was revisited under a new Skills framework and repositioned under Aajeevika as DeenDayalUpadhyaya – GrameenKaushalyaYojana (DDU-GKY) on AntyodayaDiwas (25th Sep 2013) with the launch of new Guidelines and Standard Operating Procedures (SOPs). Why was DDU-GKY set up? DDU-GKY was set up to provide hopes and aspirations for a better quality of life to a large section of the rural poor. India has approximately 55 million rural youth between the age group of 15-35 yrs. who are below poverty line and with16.16 million persons entering into the working age each year, there is a need for them to be skilled, reskilled and up-skilled. Is the scheme present across India? DDU-GKY is currently being implemented in 21 States and UTs, impacting youth from 568 districts, by over 670 projects being implemented by over 300 Project Implementing Agencies (PIAs). At present, DDU-GKY has over 1.55 lakh candidates currently in training and placements. In the coming 2-3 years, DDU-GKY approved projects to impact over 13 lakh rural poor youth at a cost of over Rs. 4,300 Cr. Why should you join DDU-GKY? Why do I need skill training? As per National Policy for Skill Development and Entrepreneurship 2015, the skill demand in India is 109.73 million. This translates to over 16 million each year from now, of whom 3 million are already being trained in Universities / Colleges. Out of the balance 13 million, close to 50% need to be trained in Modular Employable Skills (MES). By 2020, India is also expected to have a surplus of 56 million youth while the rest of the world faces a shortage of 47 million. Moreover, in a fast changing industrial environment, it is recognised that skill building is not a static process and that individual’s skills needs to be upgraded continuously if the workforce is to remain relevant and employable. Hence looking at the current and the upcoming demand of skilled force, you should get skilled trained to start earning, become eligible for better jobs, build a career and improve your current lifestyle. Are there any exceptions to the eligibility criteria? Yes, the upper-age limit for women candidates, and candidates belonging to Particularly Vulnerable Tribal Groups (PVTGs), Persons with Disabilities (PwDs), Transgender and other Special Groups like rehabilitated bonded labour, victims of trafficking, manual scavengers, trans-genders, HIV positive persons, etc. shall be extended by 10 years to 45 years. Would I be required to furnish any documents for getting enrolled? I have not completed primary school (below class 5). Can I join training under DDU-GKY? All candidates who hail from poor families, and are between the ages of 15 and 35 years, are eligible for the training programs. For women and other vulnerable groups like persons with disabilities, the upper age limit is relaxed to 45 years. What industries are covered under the scheme? DDU-GKY is industry agnostic. That said, its current training partners offer training programs in over 82 sectors, covering over 450 job-roles or trades. Candidates can only choose from skills offered in their vicinity/ assigned projects in their district. Please click on the link below to view the list. What kinds of jobs are provided under DDU-GKY? DDU-GKY’s current training partners offer training programs in over 82 sectors, covering over 450 job-roles or trades. Candidates can only choose from job-roles under skills offered in their vicinity/ assigned projects in their district. Please click on the link below to view the list. What type of skills can I get trained on? From a welder making the Maruti car to an Entrepreneur in the Agriculture sector to an X-Ray machineassistant in a Super Speciality Hospital to a Sales Person selling premium shirts to a Back-Office professional working on computers, DDU-GKY’s current training partners offer training programs in over 82 sectors, covering over 450 job-roles or trades. Candidates can only choose from job-roles under skills offered in their vicinity/ assigned projects in their district. Please click on the link below to view the list. I am confused about which skill to choose? Is there any guidance provided to help me select the right skill? Yes the best thing for you is to be chosen for the training of a skill you are already good at. You can get in touch with our nearest training provider and take an aptitude test conducted by them. This will tell you what you are good at and which skill to choose. Will the government or corporates provide the training? Under DDU-GKY, several educational institutions of repute, corporate training houses and NGOs have been sanctioned projects. The DDU-GKY is the first skill training initiative in the country to have set benchmarks for minimum standards and quality benchmarks in service delivery through its framework of Guidelines and Standard Operating Procedures (SOPs), and all its sanctioned projects implemented by its partners (PIAs) need to comply with all applicable standards. DDU-GKY approves training programs with curriculum as recommended by NCVT (National Council for Vocational Training) or as identified in the Qualification Packs (QPs) based on NOS (National Occupational Standards) by the respective SSCs (Sector Skills Council) of NSDC (National Skill Development Council). Is there a training fee? No. DDU-GKY subsidizes 100% cost of skill training of candidates at its approved training centres implemented by its PIAs in sanctioned projects. There are no fees. There are no registration charges. There are no examination or certification charges. There are no placement charges. However, candidates are required to attend all classes and OJT, put in hard work and effort to learn a trade and achieve a minimum of 70% marks in the final exam to pass. DU-GKY offers three-month, six-month, nine-month and twelve-month training courses, the duration for which are 576 hours, 1152 hours, 1728 hours and 2304 hours respectively. OJT (On-the-Job Training) is also a part of these trainings, with 30 days for a 576 hours (three-month) course, 60 days for a 1152 hours (six-months) course and 90 days for a 1728 hours (nine-months) course and 120 days for a 2304 hours (twelve-month) course. Are the classes full-time or part-time? What if my attendance is lower than 50%? If your attendance is lower than 50%, then you will not be eligible to appear for the final assessment and certification. Therefore it is essential that you attend all classes and work hard to get your certificate and placement offer. This certificate is recognized by the government and will be useful for all subsequent job applications you make. Will I receive a certificate on completion of the training? Who will be the accreditation authority? Yes, you will be provided a government recognized certificate upon successful completion of the training. In the case of training programs implemented under NCVT curricula, NCVT through its accredited assessors will perform the external assessment on completion of the duration of the course and provide the necessary co-branded certification upon passing. In case of QP-NOS, accredited third-party assessors appointed by SSCs of NSDC will perform the external assessment upon completion of the duration of the course or minimum hours as identified by DDU-GKY and provide successful candidates with co-branded certification. Most employers recognize the Certificate as a symbol of learning and achievement, which will get you a job with higher salary. It will also be recognized when applying for Government jobs (if advertised and relevant for the position offered). In addition to skill training, I also want the opportunity to finish my matriculation. Will I get the opportunity to do so while training under DDU-GKY? In some training programs, which are of longer duration, like 12 months, you will get the opportunity to complete a school year. The training centre will provide linkages with National Open Schools so that you can enroll for the class as well as complete your class examination along-side the training program. However, this facility is available only in some training programs. You will need to check before joining the training program. At the same time, all training centres will encourage and support you in the endeavor to complete your schooling. How do I locate a training centre in my area? What does a training centre look like? Each training centre conforms to minimum standards or benchmarks identified in Chapter 6 of the Standard Operating Procedures, Part 1 and should consists of a separate academic areas, assembly areas, administrative areas and residential areas. In the academic areas, you will find classrooms, domain skills labs (places where you will find the same equipment as you will in a job) for practical training, and computer centre with 1 computer per candidate, high speed always on Internet access. In residential projects, in the residential areas you will find a dormitory with a bed and cupboard for each candidate. In both the assembly areas and residential areas (if separate), you will find a cafeteria that will provide you with at least 1 meal/ snack (in non-residential projects) and 2 full meals (in residential projects). What are the facilities entitled to a candidate in a training centre? Rs. 100/- for every 8 hours of training attended (workday) transferred directly to your bank account towards meal and conveyance allowance in non-residential training programs. Will there be any financial assistance or accommodation provided in case the training centre is far from my village? Yes, in case of residential projects where the training centres are set-up in towns, we provide residential facilities with free accommodation and food. In case of non-residential projects, you will get Rs. 100/- for every 8 hours of training attended (workday) towards conveyance and meal allowance which will be transferred directly to your bank account in regular intervals during the training course. Where and how can I get myself enrolled? Please refer to FAQ number 22. What if I am not suited for the training or want to join training for another skill? Before the selection is made, the PIA training centre will test your inherent aptitude and skill. If you are found suitable, then you are inducted into the training batch. If even after induction, you feel you are not suited for the training or jobs that will result from the training, you can meet with the counselor in the training centre and drop from the program before the batch is frozen for the training, within the first 10 days. Under DDU-GKY,the training partners are mandated to place atleast 75% of the successful candidates in jobs, offering a minimum salary (CTC) of Rs. 6000 per month. This amount will include any incentive or facility the company will provide you with like transport or meals or accommodation etc. Else, the applicable charge may be deducted from your monthly salary. Who are some of the candidates who have been placed successfully? DDU-GKY has brought a huge difference in the lives of our youth. Please click on the link to read their stories. What if I need to drop-out of training in between dues to personal reasons, will I get the opportunity to continue the training after a brief interval? If you have to drop-out of training, then you will not get your certificate or placement. However, if there is another such project sanctioned in your district of domicile, then you may get the opportunity again. Will I get industry exposure before being placed? Yes, most of the skilling courses have provision for providing On-the-Job Training (OJT). The maximum permissible days for OJT are 30 days for three month course, 60 days for six month course, 90 days for a nine month course and 120 days for a 1 year course. In case of courses having duration between three months to 12 months, besides the standard duration of 3, 6, 9 and 12 months, the maximum OJT allowed shall be 1/3rd of the total course duration or 120 days, which ever is lower. Who are the top recruiters? What are the minimum and the maximum salary mandated? The minimum salary assured after our training program is Rs. 6000 per month. In case you are placed in a foreign job, the minimum salary would be US$500 per month (Rs. 30,000/- approximately). The maximum salary would depend upon the job profile and the capability of the candidate. Is there any assistance provided once I am placed? Yes, under DDU-GKY candidates are also eligible for post-placement support, wherein Rs. 1,000 per month will be transferred directly to your bank account for a period of 2 months in case you are placed within the district of domicile, for 3 months if you are placed within the state of domicile and for 6 months in case the placement happens outside the state of domicile. This is in addition to your salary earned from the employer and is to enable you to focus on the job and settle down at the earliest. What if I am unable to perform at my job? Will I get an additional placement opportunity? Each training programs empowers you to perform in your job, having trained you with the same equipment that you will find in your everyday job. However, if for some reason, you are unable to perform at the job, but have the potential and desire to work, the PIA will try to place in another job more suitable to you. In every case, you are expected to work hard and perform in your job. What if I have to drop-out of my work due to personal reasons? Will I get another opportunity? Please refer to FAQ number 35. Is there any assistance provided in case I need to migrate because of the placement? Access to information on basic social services: housing-related, schools, hospitals, etc. Access to information on basic Government services, social programmes/ schemes, etc. Are there any opportunities for placement abroad? Yes, basis the need of the employer and the requirement of the job, you could also be placed in a foreign job, with a minimum salary of US$500 per month (Rs. 30,000/- approximately). Will I get a Government job after completing the training program? No. Government sponsors your training at an institute of repute and the PIA will place you in industry. Often, employers have a hire & fire policy. How will training under DDU-GKY help me in retaining a job? Training centres under the DDU-GKY offer you courses approved by NCVT or Qualifications Packs for NOS as devised by the Sector Skills Councils of NSDC. In addition, all training centres offer domain labs, which usually have the same equipment as you will find in your job. And you will get additional courses in soft skills, functional English and Computers. You will also get to work and learn from a Tablet PC in some training centres. Most of the DDU-GKY training partners use very innovative teaching techniques that use a lot of videos and employ qualified trainers. As a result, training that you get under this program will make you job-ready and capable of performing in the placement provided. Once placed, will I grow in my job? Or is there a risk that I will remain stuck in the same position and role all my working life? In all training courses, you will be trained in the skills needed to grow in your job and profile. But you need to work hard and ensure that your superiors and employers find you suitable for promotions from time to time. After the training, can I choose to be self-employed? All training programs under the DDU-GKY are devised to make you capable for a job. There are no classes or courses for self-employment or starting a business, but if you think are ready and want to start one, the counselors will encourage you and may offer you help from time to time. If I choose to be self-employed or start my own business, how will DDU-GKY and/or MoRD help me? The Ministry of Rural Development runs several other schemes, one of which is skilling for start-ups and entrepreneurships. Once you complete your course, you can apply under the entrepreneurship and receive necessary support like additional training or small loans to start your own business. How will an association with DDU-GKY benefit my business/organisation? What are the various sectors covered under DDU-GKY? What are the various job-roles covered under DDU-GKY? There are over 450 job roles covered under DDU-GKY. Please click on the link below to view the list. In what way can we engage with DDU-GKY? Besides recruiting from DDU-GKY graduates in interactions with the placement cells of our PIAs, you can also engage with us directly in three ways, as Champion Employers, as Captive Employers and through Industry Internships. What is the eligibility to become a Champion Employer? Does your business employ or place blue-collar employees in large numbers, say more than 5,000 each year? Are your employees the engine of growth and/or rapid expansion? If your answer is “Yes” to any of the above questions, then you should definitely consider partnering with DDU-GKY as Champion Employers. Employers or Training organizations that can train and provide employment for 10,000 or more rural poor youth in the 2-3 years are eligible to partner with us as ‘Champion Employers’. Subsequently, during the tenure of the MoU, they need to train and employ or place a minimum of 5,000 rural youth annually. Standardized processes in SOPs and established Guidelines that reduce the pain of individuals and regional priorities, detailing requirements like Project Proposals, Inspections, Physical Infrastructure norms etc. As a Champion Employer, what would be my responsibilities? What is the application process to become a Champion Employer? Who are the major Champion Employers associated with DDU-GKY? What support will DDU-GKY provide to a Champion Employer? What is the eligibility to become a Captive Employer? If you or your group businesses need manpower to grow and fulfill your business goals, and you have ready training facilities, then you should consider becoming a Captive Employer with DDU-GKY. Businesses who already can train 500 or more in their own training facilities and employ them in their own organization or one of their subsidiaries, are eligible to partner with us as Captive Employers. As a Captive Employer, what would be my responsibilities? What is the application process to become a Captive Employer? Who are the major Captive Employers associated with DDU-GKY? Coffee Day Global, partnered with us as Champion Employers (as their manpower requirement exceeds 5,000 each year) is a captive employer who absorbs all rural youth trained under DDU-GKY within the organization. Similarly, Apollo Mediskills, Narayana Healthcare, Team Lease and Safe-Educate are all captive employers who are taking advantage of the Champion Employer policy. What support will DDU-GKY provide to a Captive Employer? What is the eligibility to partner through Industrial Internship? A skilled labour intensive business, which needs to add workforce to scale but does not have any training facilities can also engage with DDU-GKY in the Industrial Internship mode. This is the perfect engagement for businesses that employ a large number of blue or rust collar employees and need to rapidly increase their workforce to grow their businesses. For instance, if you are a business specializing in handicrafts and you need skilled workers to build scale. If you can ensure learning on-the-job, then you should choose the Industrial Internships route. Under Industrial Internship, what would be my responsibilities? What is the application process to partner through Industrial Internship? What support will DDU-GKY provide to an Industrial Internship Employer? Would we need to develop the course content for the training or would it be provided by DDU-GKY? The course content should be in tune with the requirement of industry/trade. DDU-GKY does not provide the course content. The employer can use a course content certified by National Council for Vocational Training (NCVT) or Sector Skills Council (SSC) or any other agency notified for the purpose by MoRD. Does DDU-GKY engage any implementing agencies we can collaborate with for training and placement? How will it benefit us to recruit from DDU-GKY? The biggest advantage of recruiting from DDU-GKY is a cost savings of about 7-8%. This is essentially savings on mobilization and reimbursement of most or a part of the training cost. Rural poor youth tend to be more motivated and committed to the organization and the job when they get one as opportunities to fulfill their career and lifestyle aspirations are limited. With proper counseling and direction, they tend to work harder to integrate with mainstream society and driven by ambition to achieve personal and social goals. Also, they are malleable and can be moulded rather more easily in any culture and do not carry any burden that needs to be un-learned first. Therefore it’s a win-win situation to recruit candidates from DDU-GKY skilling program. What is the process of recruitment from DDU-GKY? Provide for adequate support to facilitate transition (food + accommodation if needed). In most of the cases, trained rural youth are migrating from their native villages for the first time, and are getting exposed to a city or industrial centre for the first time. Adjusting to food and finding suitable accommodation are some of the challenges that they find difficult to cope with, and this often results in return to villages. By offering support for one meal and shared accommodation, you will ensure higher commitment as well as quicker adjustment to work-life. Offer a career path that you will afford to performing candidates over time. Knowing ‘what to achieve and in what duration’ are motivators, be it for urban or rural trained youth. Support our monitoring teams in their efforts to collect data & MIS from time to time. In regular intervals, officers from the Ministry or its appointed monitoring & evaluation agencies will visit and interact with you, your line managers as well as placed candidates. This healthy interaction is to verify the claims of the PIAs (for disbursement of incentives) as well as an opportunity for you and your team to contribute proactively and constructively in bettering the quality and content of training service delivery. In addition to visting teams, you can also write to the Ministry directly: The Deputy Secretary (Skills), Ministry of Rural Development, 3rd Floor, Eastern Wing, Thapar House, 124 Janpath, New Delhi 110 001. Each fiscal year, we conduct at least one meeting or panel discussion with CxOs and Line Managers. If you are interested in sourcing your manpower talent from our trained candidates, please click on this link and fill in the form. Our relevant partners and placement cell coordinators will get in touch with you at the earliest. I am already training and skilling youth in my facility. Can I partner with MoRD? Yes you can partner with MoRD as a training partner, you will have to check if you fulfill eligibility conditions as laid out and register with the Ministry for the same. However, if you are an employer and train youth specifically for jobs in your organization or industry only, you can partner with MoRD under any of the employer engagement policies like Champion, Captive or industrial internships. Can I use my CSR fund component to train youth as per my requirements? Yes. You can use your funds in the CSR share to train youth under the DDU-GKY program. This is by way of sponsorship of candidates in one of the approved PIAs and training centres of the MoRD. Please write to the Deputy Secretary (Skills) for more information in this regard. I need interns on regular intervals. How can I benefit from DDU-GKY? If you need more than 500 interns each year, who will learn a trade or a job-skill in your organization, working alongside one of your employees, and you can offer them a job in your organization after 12 months of training, then you can partner with the Ministry under the Industrial Intership program. We need skilled manpower for various roles, some of which need longer training durations and costly training equipment like simulators etc. We have some such equipment already in place. How can we partner with DDU-GKY? You can partner with the Ministry under the Captive employer policy by way of a MoU. The DDU-GKY will offer you applicable cost of training and help you in mobilizing youth for your training programs, also using shared resources like Self-Help Groups and other village level resources. We are an organization that offers foreign placements to skilled and experienced workers. How can we partner with MoRD or DDU-GKY? You can partner with MoRD as a training partner. Please see the eligibility criteria for training partners in this site. We need to re-skill experienced candidates for foreign placements. Are there any such training programs under DDU-GKY? Currently, there are no re-skilling programs under the DDU-GKY, however, you can always engage with the Ministry to offer such training programs. The Ministry prioritizes all training proposals that offer foreign placements at the completion of the course. How will an association with DDU-GKY benefit my organisation? DDU-GKY is uniquely placed in the skill training eco-system of the country. As part of the Ministry of Rural Development, it caters to the largest potential worker stream in the country, the 551million strong rural poor youth between the ages of 15 and 35. Through its parent program of Aajeevika, it has access to numerous Self-Help Groups (SHGs) across the country where the members not only facilitate in mobilization but also in ensuring attendance, facilitating village or community level participation and monitoring progress at regular intervals. It is also connected with rural Employment schemes like the MGNREGA, has credible access to Gram Sabhas and Gram Panchayat through its sister agencies and an experiential knowledge spanning over decades of running successful programs in the hinterland. This ensures that DDU-GKY can access and mobilize a large number of committed youth to training centres and facilitate training and transformation. In addition, DDU-GKY has invested in the making of Guidelines and Standard Operating Procedures (SOPs) to define minimum benchmarks, systematize processes, define service level standards and build transparency in operations as well as managing delays and defaults. In addition to processes, it also lays down applicable guidelines for making claims and demands on achievement of outcomes, thereby eliminating any role of individuals or personalized inspections. DDU-GKY is also in the process of adopting a distributed ERP system, called e-Kaushal and the Public Financial Management System (PFMS) to facilitate programme management, and ensure transparent investments and tracking of fund utilization. So if you are an educational institute of repute, a large employer with training infrastructure or a large private skill-training expert, committed to delivering better quality training and output, DDU-GKY is the right partner to grow with. What are the various trades covered under DDU-GKY? From a welder making the Maruti car to an Entrepreneur in the Agriculture sector to an X-Ray machine assistant in a Super Speciality Hospital to a Sales Person selling premium shirts to a Back-Office professional working on computers, DDU-GKY’s current training partners offer training programs in over 82 sectors, covering over 450 job-roles or trades. Please click on the link below to view the list. What are the eligibility criteria to partner with DDU-GKY? Any registered organization (other than proprietorships or partnerships) can apply to be a Training Partner. If you are already registered with National Skill Development Corporation (NSDC) as a partner can also apply directly to us. At the time of application, a partner should have positive net worth in at least two of the last three financial years and a turnover of at least 25 percent of the size of the project cost. The training partner should also be making profits for at least 1 year in the last 3 years to ensure sustainability of the relationship. DDU-GKY allows for a consortium of partners to apply, however in such circumstances, one of the partners has to become the lead partner and ensure the delivery of all objectives and outcomes of the ministry. What is the application process to partner with DDU-GKY? To begin with, you would need a Permanent Registration Number (PRN). This is a number allocated after a partner registers with the DDU-GKY as a PIA. The application form for a PRN has been provided in the website( www.ddugky.gov.in.) In the form, you are required to provide organizational details like Address, Registration Certificate issued by the Registrar of Companies or Registrar of Societies, a scanned copy of the picture of the main premises etc. On completion of the form, and the verification process by the Ministry, the PRN is issued. Project applications without this number cannot be considered. For step-by-step guidance on how to apply for the PRN please click on the PRN User manual. Can the proposal be submitted online? Yes, proposals can now be submitted online. Please log on to www.ruralskills.in and click on the Application User manual for step-by-step guidance. What are the documents that need to be furnished along with the proposal? The online format for submitting proposals is comprehensive and involves provisions of several documents and reports like Population Demographic and Skills Gap Study for the district/ state proposed, audited financial reports (B/S & P/L Statements) etc. The online s/w continuously prompts users to upload necessary documents and evidences as needed in each and every step. You will need to read the instructions in the manual carefully, before starting to fill in the project proposal. As a training provider, what would be my responsibilities/role? Post submitting the proposal, what are the various steps involved for the final selection? Once the project proposal is submitted and accepted through an acknowledgement issued by the Ministry, the proposal is then appraised for its financial and project merits, scored automatically and prioritized accordingly. The proposal is then approved by competent authority of the programme division and recommended for considerations of the Empowered Committee appointed by the Ministry. The Empowered Committee of the Ministry, reviews all proposals submitted against the needs of industry and state demographics and sanctions on the basis of recommendations of the central and state departments. What kind of financial and operational support will be provided by DDU-GKY? DDU-GKY offers a fixed cost with incentives on achievement of outcomes and support training partners that meet eligibility requirements. We also encourage innovations, not only in training and pedagogy, but also in projects that can lead to better outcomes over time. The investment model follows the preferences indicated below through a simple process of categorization of partners and projects. What is the current set-up in states to help us implement the program? In some states, DDU-GKY has empowered the states to plan, sanction and implement training projects as sufficient capacity exists or has been created. Such states are referred to as Action Plan States (APS). In such states, a Chief Operating Officer (COO) or Mission Director (MD) as part of the State Rural Livelihoods Mission (SRLM) or a dedicated State Skills Mission (SSM) usually leads the program. The COO or MD is supported by a State Programme Manager (SPM), usually dedicated to DDU-GKY and District Programme Managers (DPM) in each of the districts of the state, or at least in the priority districts of the state. The operations team is assisted by a Technical Support Agency and other staff like Finance, IEC (Communications and Advocacy) etc. In states where such capacity is being developed or invested into, the SRLM or SSM usually has a dedicated State Programme Manager and District Programme Managers for DDU-GKY. In addition to the programme management teams, there are a host of village to district level resources that can be accessed during mobilizations, like for instance Self Help Groups (registered under the Aajeevika programme of the Ministry), Panchayati Raj Institution Officers, local District Administration (DMs/ SDMs/ JMs/ SJMs/ Block Development Officers among others). In some states, there are also other shared resources like Gram RozgarSewaks (GRSs) in Odisha, self-appointed Committees (VPRCs in Tamil Nadu) etc. There are also Prime Minister’s Rural Development Fellows (PMRDF) appointed in over 160 districts of the country. All these resources can be accessed for support in mobilization and tracking placements through contact with family members of community members in the villages. I have submitted my proposal. How can I check the status? Once you submit your project proposal, you can track it by writing to the Ministry. You should contact the Deputy Secretary (Skills) for the same. Please refer to the Guidelines for the applicable time frame for response on your projects proposals. In case there are any clarifications sought by the Ministry, you will be contacted by relevant personnel and given a time frame to comply/ provide documentary evidences etc. Are there any quality benchmarks or set procedures developed by DDU-GKY for implementing the program? Yes, DDU-GKY has invested in the making of Guidelines and Standard Operating Procedures (SOPs) to define minimum benchmarks, systematize processes, define service level standards and build transparency in operations as well as manage delays and defaults. Please click on the link to view the Guidelines and Standard Operating Procedures (SOPs). What is Skill Gap Analysis (SGA)? Placements, job retention and career progression are the desired outcomes of DDU-GKY. Achievement of these outcomes is linked to the existing and potential demand for skilled manpower in industry across various sectors. A study of the demand for skilled manpower, from the district level upwards to the national level is called the Skill Gap Analysis. This requires the PIA to study the local, regional and national industry in their preferred sectors to identify demand through replacement of existing labour on account of age or shift in technology or creation of new jobs through fresh investments or line expansions at various job-roles. Matching demand with supply opportunity through demographic analysis of the region completes the Skill Gap Analysis for the making of a Project Proposal, PIAs need to factor in time, as projects are for longer durations with batches becoming eligible for placements regularly. Additionally, DDU-GKY requires that there is social inclusion of disadvantaged sections of society like women, SCs/STs, Minorities and Persons with Disabilities (PwDs). The operating ratios are: 50% (29% SCs/ 21% STs), 33%Women, 15% Minorities and 3% PwDs. These percentages however, apply for the project and can differ from time to time as notified by the Ministry, as well as for specific areas in the country. How should a typical training centre look like and what are the infrastructural facilities that should be available to the candidates? Geo-tagged time-stamped Aadhaar linked biometric attendance facility for both trainers and trainees in training centres and in Industries with interns under the program. In case of projects with duration of more than 12 months, the attendance records maintained in the institution where training is being imparted shall be used. CCTV recording facilities in classroom, labs and common areas and local storage of the data for a period of 6 months. What is the fund flow mechanism in place currently? 1 25% of project cost On sanction of project and signing of MOU. Spending 60% of funds disbursed as 1stinstalment as visible in web site. Achieving 40% of physical target inclusive of sub-targets such as for SC/ST, minorities etc. Submitting audited expenditure statement like P&L statement, Balance sheet etc. with respect of previous year for cases after 30thSeptember. Spending 90% of funds disbursed as 1stand 2nd instalments as visible in website. Achieving 90% of physical target inclusive of sub-targets such as for SC/ST, minorities etc. Submitting audited expenditure statement like P & L statement, Balance sheet etc. with respect of previous year for cases after 30thSeptember. 4 10% of project cost On achieving all targets and submission of project closure documents as well as signed scorecard. However, the release of the 4thinstalment will not be held up till the one-year tracking is complete. What is the role of the Technical Support Agencies (TSA)? Would we need to develop the curriculum for the training or would it be provided by DDU-GKY? Training and course content should facilitate learning by rural poor youth who may not have exposure to English. There should be mandatory modules on soft skills, functional English and basic IT skills for a minimum of 160 hours in a 3 months course duration. For more information, please go through the Guidelines here - . Mixed media modules, interactive pedagogy, which includes games and role-plays. Curriculum and daily session plan should be uploaded on the PIAs website and transferred on to http://ddugky.gov.in. Adequate practical and on the job training /internship must be incorporated into the training module where necessary. Course material and exercises should be available online so that trainees who wish to use it to revise and improve themselves are able to do so. Keeping in mind the proliferation of mobile based learning opportunities, the development and deployment of mobile phone based content is expected. What are the activities to be undertaken for mobilising candidates? The quality of candidates mobilised has a significant impact on retention during training as well as in the jobs they are placed in as well career progression. Institutional Tie-ups: In the areas identified by SRLM for implementing the programme, the PIA should carry out mobilisation by involving institutions of the poor established under Aajeevika as well as GPs. Both GPs and Aajeevika institutions have an important role in ensuring that the skills and placement needs of all eligible persons in all habitations are addressed. Mobilisation criteria: The willingness of the candidate identified after mobilisation to undergo the training programme has to be ascertained. The selection process for identifying the trainees has to be transparent and open to all stakeholders. There is a fine balance to be had between aspiration, eligibility and aptitude. While all residents have a right to be considered, it could well mean that not all those who are considered for a particular trade are selected. This is acceptable, provided records are maintained that show that aptitude tests did not indicate a match between aspiration and potential or the aspirant was not eligible. Focus on Inclusion: PIAs shall give priority in mobilizing and selecting candidates identified as focus/special groups in the DDU-GKY Programme guidelines. They should also adopt a GP saturation model while mobilising. This serves two purposes. It ensures that none of the residents who are desirous of being skilled and placed are left out from being considered. It allows both parents and candidates to support each other during training and placement. This is especially important if training or placement happens to be in a location distant from their place of residence. Counselling: Candidate counselling should provide information to prospective trainees on the nature of work in the sector/trade, availability of jobs, deliverables by the employer, entitlements, growth prospects and risks involved. This is aimed at helping both candidates and parents make informed choices and to match aptitude with aspirations. Within the frameworks developed by SRLMs, counselling may also include creation of on-job counselling sources as well as Job Melas. Selection: Selection is the stage after counselling. A list of those selected on the basis of aptitude tests (psychometric and others) and counselling (by trained counsellors) is prepared and uploaded on the designated MIS. While it should be ensured that all those desirous of being skilled and placed are considered and put through counselling and aptitude tests, it is possible that not all will be found to have the aptitude required for the training program being organised by that particular PIA. These cases should be separately identified and taken on a state data base for follow up by the SRLM so that these persons get a chance to enrol for another trade with the same or another PIA at the earliest. Who are the stakeholders that should be reached out to for support? Gram Panchayats, District & Block Administrations, SRLMs/ SSMs, CTSAs, Ministry (Centre & State),respective Ministers and their offices, NCVT/ SSCs of NSDC, Accredited Assessment Agencies, Public Grievance Cells and Anti-Corruption Cells/ Vigilance Departments for various aspects. Is there any communication material provided by DDU-GKY that can be used to reach out to stakeholders? Yes. Please click on the link to download the DDU-GKY campaign aimed at Rural beneficiaries as well as the National campaign aimed at employers. What would be the approximate unit training cost per candidate? What is the minimum qualification of a trainer? DDU-GKY lays huge emphasizes on the quality of trainers hired for its skilling program. It is important to ensure that only those persons are deployed as trainers who have the requisite exposure to the requirement of prospective employers. They should also possess the knowledge, skills and attitude needed to be a good trainer in his/her domain. In the first instance this has to be tested and verified by the Q team of the PIA and verified by the SRLM or its TSA. Knowledge can be tested with the help of written tests and administering practical tests can test the skills of the trainer. However attitude can be tested only in the real classroom situation. This is why it has been mandated that all class room and lab sessions should be recorded using CCTV cameras. Samples of the footage drawn using statistically valid techniques should be examined by domain experts in the Q team of the PIA and verified by the SRLM or its TSA every month. Based on this each trainer in the DDU-GKY ecosystem should be graded separately for knowledge, skills and attitude. Is there any capacity building training that will be provided to the trainers? How will the monitoring and evaluation of the project take place? Fortnightly monitoring and guidance notes to PIAs using online MIS of PIA: TSAs will monitor the online MIS on a regular basis and issue/upload fortnightly guidance notes to identify and notify non-compliance and for improving the use and functioning of online MIS. Monitoring of compliance by PIAs on points raised in guidance notes: PIAs will be required to comply with the points raised in the guidance notes within a week of the upload of guidance notes. Monthly inspection of training centres by Q team of PIA: Q team of PIA will undertake monthly inspection of training centres. The proceedings of these visits will be recorded through GPS-enabled video/audio clips and uploaded along with action points for compliance by the training centre manager and trainers in the workflow MIS and monitored for compliance. Bi-monthly inspection of training centres by State TSA: SRLM officials/ State TSA will undertake bi-monthly inspection of training centres. The proceedings of these visits will be recorded through GPS-enabled video/audio clips and uploaded in the workflow MIS along with action points for compliance by centre managers and trainers and monitored for compliance. Tri-monthly inspection of training centres by MoRD’s CTSA: MoRDs CTSA will undertake tri-monthly inspection of training centres. The proceedings of these visits will be recorded through GPS-enabled video/audio clips and uploaded in the workflow MIS and monitored along with action points for compliance by centre managers and trainers and monitored for compliance. GPS enabled bio-metric attendance of trainer and trainees: Deployment of geo-tagged, time stamped Aadhar-linked biometric devices for taking attendance of trainers and trainees and pushing it in real time to a central server visible to the Q team of the PIA and State/MoRD CTSA will be one of the pre-requisites for starting up a training centre. Online logging of training centres: Daily opening and closing of training centres has to be logged online along with geo-tagged time stamped photographs of the class room and lab. What is the current MIS in place? An Internet based 3-tier concurrent monitoring system across SRLMs/ DDU-GKY SSMs, CTSAs and MoRD is developed based on the Programme Guidelines and detailed SOPs for all service delivery processes. This is a CTSA led initiative (called MRIGS) and is currently being field-tested by NABCONS. Also an Internet based Project Proposal Application Form has been developed by DDU-GKY to ensure consistency across states and achieve the goals of the programme division. This includes built-in prioritization of PIAs and projects and also scoring of proposals. DDU-GKY has also modified and implemented Public Financial and Monitoring System (PFMS), an online fund management, fund release and re-conciliation system used by various government agencies. It enables transfer of funds to various agencies and to beneficiary accounts and is inter-linked with the core banking system of over 90 banks all across India. However moving forward, DDU-GKY proposes to develop a comprehensive IT system, called eKaushal system. eKaushal system is envisaged to be available across both web and mobile, capture data and documents related to program implementation and operation, support evidence based decision and policy making and facilitate exchange of information with all the key stakeholders and other skill development programs. This internet-enabled workflow driven ERP platform will handle all aspects of programme management including submission of proposals, release of funds, training centre management etc. Therefore MRIGS and Online application form would subsume under eKaushal with PFMS integrated into it. How will the assessment and certification be done? Continuous Assessment: Internal and continuous assessment should be an integral part of the course curriculum. This should be in the form of announced and unannounced quizzes, assignments and other types of tests. The questions asked, answers given and marks obtained by each trainee should available in the password-protected area of the PIAs web site. This will be used by the PIAs own independent quality team when it makes monthly visits to each training centre. During these visits each centre and each trainer will be marked and ranked using a scorecard developed by NIRD. These marks will be verified during bi-monthly inspections of each training centre by the SRLM or its TSA as well as by NIRD/NABARD Consultancy (NABCONS). The results of PIAs own quality inspections is to be made available on the PIAs web site as it is a list of action points from each visit and details of compliance on each. Third party certification: Independent certification and assessment by third party agencies of both curriculum and the skill, knowledge and attitude level of each trainee as acceptable to the industry or employer is mandatory. This is to ensure that DDU-GKY pass outs are of a high standard and are eagerly sought after by employers. The names and details of the certificates and the assessment agencies shall be mentioned in the project proposal. These should include only those agencies that have been empanelled by NCVT/SSC/notified by MoRD in the case of skills and NIOS in the case of school bridge courses for school dropouts. Own certification in cases of established brands: Own certification in cases of established brands could be used provided MoRD has approved it in advance. What type of placements are recognised by DDU-GKY? Placement at DDU-GKY is defined as continuous employment for a minimum of three months. The period of continuous employment need not be with the first employer. However the trainee should have worked and received payment for three continuous months, proof of which can either be in the form of a salary slip or a certificate indicating salary paid signed by the employer and salary received by the person placed along with a bank statement. A minimum placement of 75%1 of trained candidates is a non-negotiable in DDU-GKY. 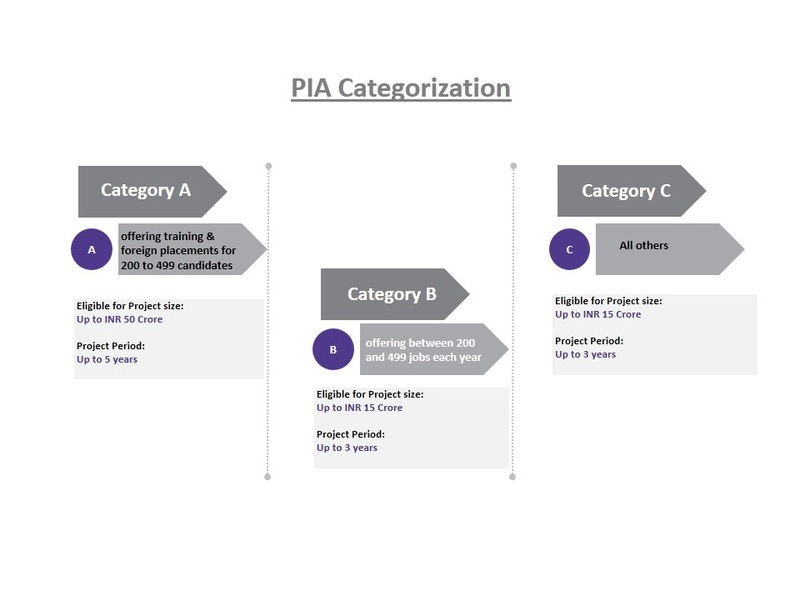 Captive placement: PIAs having their own requirement train and absorb the trained persons in their own organisations. PIAs submitting projects for captive placement should submit details of their own manpower requirement based on a realistic estimate of current needs. Captive placement for a second batch of trainees will not be allowed, if more than 50 % of DDU-GKY youth placed with the same organisation has left within a span of six months. This is being insisted so as to minimize the danger of an “attrition based” placement model. Placement providing jobs having regular monthly wages at or above the minimum wages: The proof of regular wage employment is demonstrated by the salary slip from the Human Resources department of the organization. In case the organization does not have a HR department, certificate issued by the employer indicating wages paid and counter signed by the employee along with the bank statement indicating that wages have been paid by crossed demand draft or money transfer will demonstrate proof of regular wage employment. Placement in government organisations/with government contractors involved in public service delivery: Placement in public service delivery programs such as National Rural Health Mission (NRHM), MGNREGS etc. and institutions such as PRI, etc. are allowed provided it is continuous and full time and minimum wages is provided and proof of employment is available. Placement in jobs in foreign countries: Placement in jobs, which can provide a minimum salary of Rs. 25,000,are permitted. Trainings that have the potential to provide salaries in the above range will only be approved. Are there any monitory support or incentives given to the training partners? The support structure as above is over 160% of the total cost of training offered to each PIA for a 3-month duration course. How can I share my best practices and view the same of other implementing partners?